Have you ever been through the process of forgiveness? I thought I’ve forgiven, but I now realize I glossed over it. I pushed the hurt away and marched on… while the pain kept reeling its ugly head. I wondered why I just recently noticed this pattern of mine? Because I’ve been slowing down. I’ve been purposefully choosing my actions, pausing in between. I’ve been lightening up… and that’s when I realized the heaviness. The heaviness of resentment. Feeling pushed down by my own mind from my own thoughts of what’s been done “to” me. I didn’t even realize what I needed to do was forgive. I didn’t know I felt hate (annoyance, resentment, recurring painful thoughts… but let’s call it out for what it is). Once I paused a bit, I couldn’t ignore the facts. I DID NOT LIKE WHAT THIS PERSON SAID AND DID. I didn’t find it acceptable. But I had to accept it. But I DIDN’T WANT TO. So I didn’t. I wasn’t ready. And honestly, I didn’t know how to accept the unacceptable. As a result, I blocked myself off… not only toward this person, but I held little blocks against everyone. And because of this, everyone got the short end of the stick. They got only what was left of me, not all of me. This is the biggest tragedy. Much more than what I thought was done “to” me. I STILL DIDN’T WANT TO ACCEPT WHAT HAPPENED. Until I realized what I was losing. I was losing me. My energy. My happiness. My ability to live full out with people I chose and who chose me. I accepted it. ALL OF IT. Ugggg. What more can I do?! This is when I realized it. This business of forgiveness. I was in a situation where I had to forgive… if I wanted this weight off me. Everything else I tried and it wasn’t working. Including talking to this person. Asking questions. Trying to so hard to understand all the words and actions that felt so hurtful. But I was just one person and it takes two to relate. It takes two to have a relationship, and the quality depends on both people as well. I had to let it go in a real way. It simply wasn’t enough to mentally understand. It wasn’t even enough to feel compassion for the other person… because I wasn’t compassionate toward myself. THIS PART WAS ESSENTIAL. I had to feel the pain and be self-compassionate. I had to cry out and name what I felt was the awful thing that was done. I had to be my own best friend and cradle myself and hug it out and be by my side as I sobbed about the devastation I felt. Then I saw a crack of light. It was an energy thing. I felt hopeful. There was a warmth in my mental attitude. I began to feel compassion for this person who I was trying to forgive. I suddenly wasn’t taking it as personally, although it’s a delicate balance, because I will not allow myself to be hurt by this person again. However, I wanted this fact not to affect my ability to trust others. I didn’t want even a part of me to be blocked off. This was the hardest thing. It’s sooo much easier just to block off! To be closed off a bit “just until I got to know someone”. Well, it doesn’t work that way. Either we’re open or we’re not. And the biggest challenge? To be open toward this person and at the same time ensure I’m not hurt again by them. I don’t even have to talk to this person to do this. I just have to be super conscious when they enter my mind, then shift my thoughts to more loving ones. Not easy, but it can be done. With practice. So, on to the practice of forgiveness. The process of forgiveness. The deep spiritual journey of forgiveness. The going through the hell of forgiveness. Because, guess what? Forgiveness requires real change. It requires US to change. It has nothing to do with the person we’re trying to forgive. Forgiveness is an inside job. It’s a gift we give ourselves because we love. It’s our human nature to love. Forgiveness helps us tap into that unconditional love. It gives us the ability to feel love. 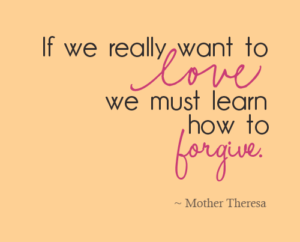 When we feel love, we can learn to forgive. That’s the focus. Practice self-compassion and loving YOU. Then you’re able to see that person that hurt you in a new light. You soften. You understand that person on a human level. Because you feel pain, you can relate to the pain they also must have in their life. It may look different, but pain is pain. You also begin to know what to expect from that person – and it no longer is the fantasy you’ve held that person to play a part of. You free them to be who they need to be and do what they need to do on their journey, and you’re free to do the same. You don’t ever have to speak to that person again in order to forgive. You don’t have to DO anything, unless you choose to. You just need to be open… to want to forgive… to want to open your heart… to want to learn how. See the theme? It’s about being willing. Expand instead of constrict, and the vulnerability of this will send shudders through your body, but stay open. Ride the wave. Trust you won’t drown. Freedom is on the other side of the forgiveness process. Know that you don’t know all the answers. Be ready to shift some of your beliefs to create space in your heart that up until this point you’ve restricted. This isn’t easy. Forgiveness is serious business. 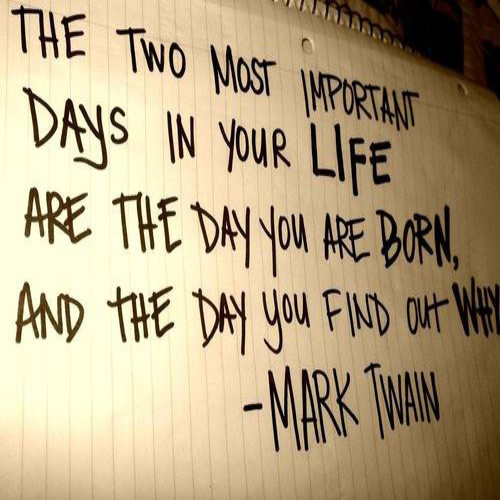 It’s about YOU and YOUR life. And your life matters. Release it… the pain, the heartache, the disappointment, the devastation. Wish everyone well as you think of them – especially the ones that hurt you the most. Especially those special souls… because they are your greatest teachers. They are your ticket to freedom. If for nothing else, love them for this. And believe it or not, some day, if you’re willing, you’ll be able to love them even with all their mistakes and imperfections. Wow, if you’re at this point, you know what that means? It means you finally love yourself completely, flaws and all. What a relief to be loved like that.